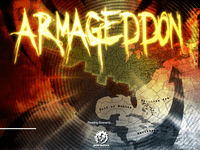 "Hearts of Iron II: Armageddon is an expansion for the game Hearts of Iron II: Doomsday.It contains everything from the previous versions of Hearts of Iron II. Two new scenarios are included. The Abyss is a level where none of the 19 fictional nations are at war, whereas Armageddon is a world war between all of the nations. The game includes these scenarios to provide balanced scenarios for multiplayer use alongside the historical ones." Source: Wikipedia, "Hearts_of_Iron_II:_Armageddon," available under the CC-BY-SA License.